If you’ve been following along, you probably didn’t guess that the final special post of my Canberra journey would have to do with LED lighting, but in fact this was the impetus for me to have met with the reader and receive a bag of goodies in the first place. The reader had installed a set of these LED retrofit tubes, and one of them had recently failed and they were wondering if I could get to the root of the cause and advise them if it was something that was likely to affect the other units they have used. Having not dealt with 4-ft replacement tubes (mainly because of their relatively high expense), I thought it would be a good chance to open one up and find out what’s inside, and get a better understanding of just how the retrofit tubes work with basic fluorescent ballasts. That being said, logistically, it was a whole lot of fun to tote a 1.2m tube with me back to Sydney. The bus driver did give me an odd look as I proposed the tube to be my “second” piece of luggage (which I am entitled to), but waved it though. Ultimately, it survived the journey relatively unscathed. 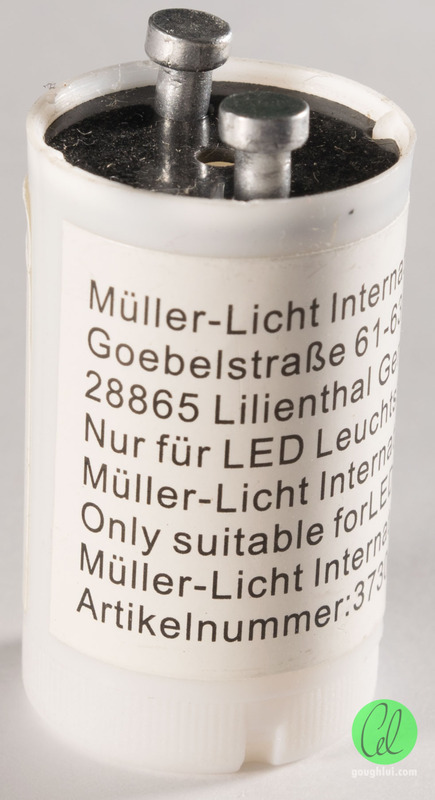 Owing to the difficulty of covering the packaging due to its long shape, it has been “segmented” above, but basically it’s a Muller Licht 18W 1700lm T8 retrofit LED lamp for use in single-circuit general lighting purposes. The unit weighs 260 grams, and comes with a dummy starter. It promises 30,000 hours of lifetime, >100,000 switching cycles, 150 degree light output, a CRI of >80 and a luminous efficacy of 94lm/W. The unit is designed for an ambient temperature of 25 degrees C (which is a little low), although it claims to be designed for indoor use only, with only regular inductive control gear ballasts (not electronic). The packaging itself actually came from a later purchase, as I was informed, and the failed product is an older unit. 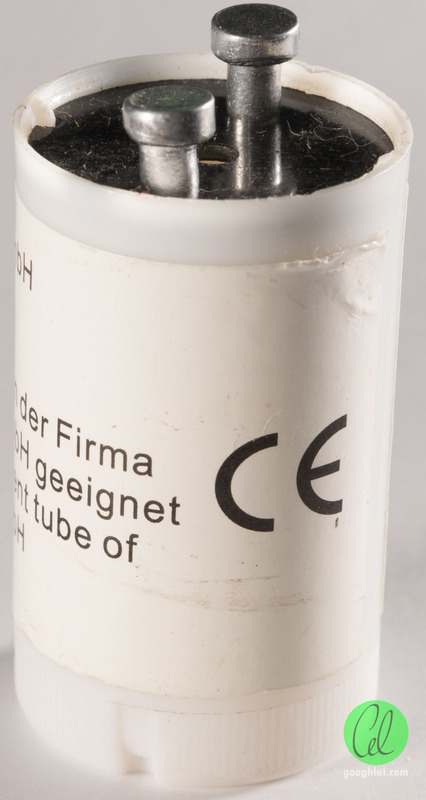 The tube itself is made up of opaque plastic ends (one end with printing, shown above) and a translucent middle with an aluminium “base” on one side and the “light emitting” side on the other. The light distribution is not identical to the 360 degree emission of a regular fluorescent tube, but this is probably advantageous as in most installations, light is only needed from one side, and the quality of the luminaire reflector (and its dirtiness) doesn’t affect the light output as it otherwise would. According to the specs, the unit claims 97mA draw for 18W, or an estimated power factor of 0.8 making it a fairly high power factor but not ideal. It claims 230V and a CCT of 4000K matching the “cool white” of most fluorescent tubes. It claims it is not dimmable, and has the Australian regulatory compliance mark, making it “compliant” for sale in Australia. Unlike most regular fluorescent tubes, the end pins are silver coloured, so are probably plated with some finish. Regular fluorescent tubes tend to have brass pins, so I wonder if a change of metal might lead to contact problems in the long run due to dissimilar metals. As promised, it comes with a “special” starter for use with LED tubes. From the reader’s description, the unit was supposed to be faulty. The first thing I tend to do with any unit that comes in is to diagnose and replicate the fault. Luckily, last week was a council “clean-up” day, so I managed to salvage a few unwanted 2x36W units so that I could do some side-by-side testing. This is where I was perplexed, as despite running the tube for hours side-by-side with a regular Philips Lifemax tube (which I also picked up and salvaged), it manifested no faults. Even cycling the tube a number of times, tapping on it, shaking it, bouncing it on its end pins against my floor did not provoke any misbehaviour. That being said, if you’re doing this kind of side-by-side running, do make a note of which starter position is for what lamp – otherwise you could end up getting strange results or even damaging your LED tube! Based on a side-by-side comparison with a (likely) well-used Lifemax tube, I found the brightness to be comparable. Despite the 1700lm rating of the LED, I think the better light distribution wins it more favours in directing light to where it needs it more. The Lifemax tube has about a 3070lm rating (85lm/W which is comparable to the LED tube), however, it is a little aged, it distributes light 360 degrees and the rating is likely only achieved with high-frequency electronic ballasts rather than old-fashioned inductive line-frequency control-gear. However, when it comes to colour rendition, I would have to say that I prefer the fluoro tube to the LED – it’s just that little bit better and more natural looking. That being said, the LED tube is a little flexible, so it will take a hit without shattering, starts almost immediately with no blinking and it claims to use half the power, so there are a few benefits to the LED tube. 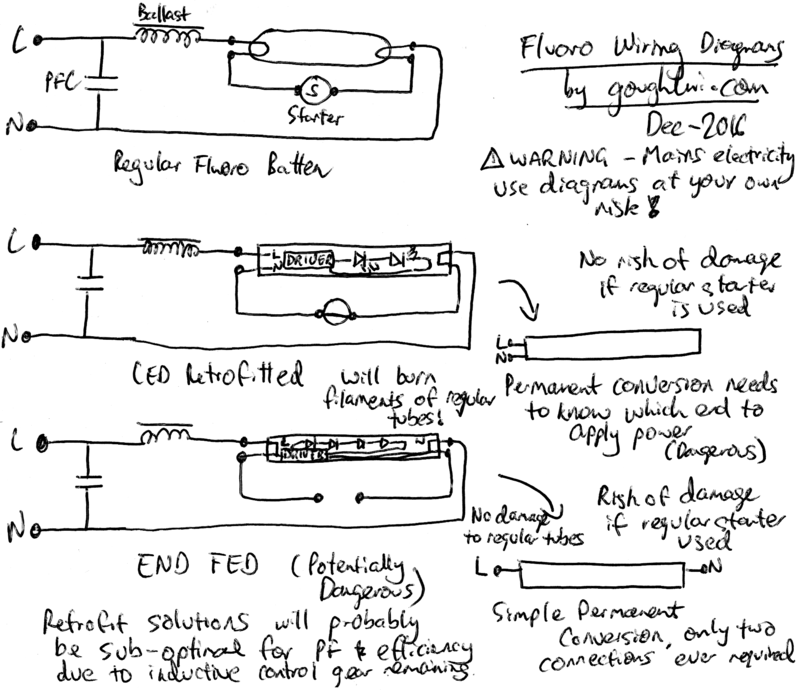 While these retrofit tubes are really a “plug and play” solution, it’s probably an interesting thing to try and understand how they achieve their plug-and-play behaviour and understand the possible pitfalls of this. The first thing to note is that our dummy starter is just a wire link crimped between the two pins. Testing the tube itself, I found the text-end of the unit to be the live-neutral connection, whereas the non-text-end to be shorted through. We will find out more about what is actually inside later on. This leads to the following circuit diagrams – note that I will not be held responsible for any errors or omissions, or damages which might arise from using the following information. Use at your own risk. A traditional fluorescent inductive control gear in Australia is shown in the top diagram. This uses a choke/ballast in series with the tube, which has a starter across it. This whole arrangement is paralleled with a polyester capacitor which is designed to compensate the power factor of the set-up, so this is known as a “high power factor” configuration. Upon starting, the voltage across the starter’s gas allows for bimetallic strips to warm which short out and make momentary contact, allowing the filaments to receive a burst of heat, and then swiftly break, allowing for an inductive kick to ionize the gas within the tube. If the discharge is stable, then the starter does not cycle, and the tube pulls the voltage down below that of the glow voltage of the starter, otherwise the cycle repeats. In the case of this retrofit tube, this is illustrated in the second diagram. The starter is shorted, and so is the far end of the tube, and this serves to “loop around” the neutral so that both live and neutral appear on the same side of the tube. This allows for the driver (presumably at one end) to run the LEDs inside. 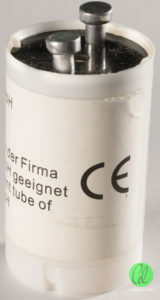 This has an advantage that if the tube is fitted with a regular fluorescent starter, it’s likely that the tube will not be damaged, as the starter allows the tube to run when closed, and when it opens, the inductive kick is developed across the ends of the tube which have >260Gohms of resistance (when tested with my U1461A). However, if the dummy starter is fitted with a regular fluorescent tube, then it’s the same as having a “welded” starter situation – the filaments will glow red hot and be destroyed. Another possibility is the “end fed” design, which apparently some very early retrofit tubes used. This has live and neutral at each end, and both pins “shorted” together. The starter is not required, and thus operation is possible despite not modifying the fitting. The internal driver is fed from both ends as a result. This arrangement is likely to result in damage if a regular starter is connected, as it will develop an inductive kick across the tube’s input similar to being hit by a surge. In the case of a regular fluorescent tube being installed, the open starter configuration is a safe one – the tube just will not strike. While the latter two configurations are possibilities – the end-fed configuration is rarely seen as it does cause safety issues if someone “pokes” around a tube with the fitting energized (even if they shouldn’t) and leaves mains voltage across the starter terminals. A common drawback of both configurations is that the choke remains in series, resulting in loss of voltage and DC resistance losses (reduced efficiency). The combined effect of the choke and capacitor can serve to produce poor power factor, even though the tube itself may have a good power factor. This will be explored further in the next section. However, it’s clear from this that a retrofit can fail for many different reasons even if the right control gear is used. The reason is that for the lamp to operate, a total of six connections need to be made. In case any one of these connections has oxidized, or isn’t made reliably, the fitting will flicker or fail. 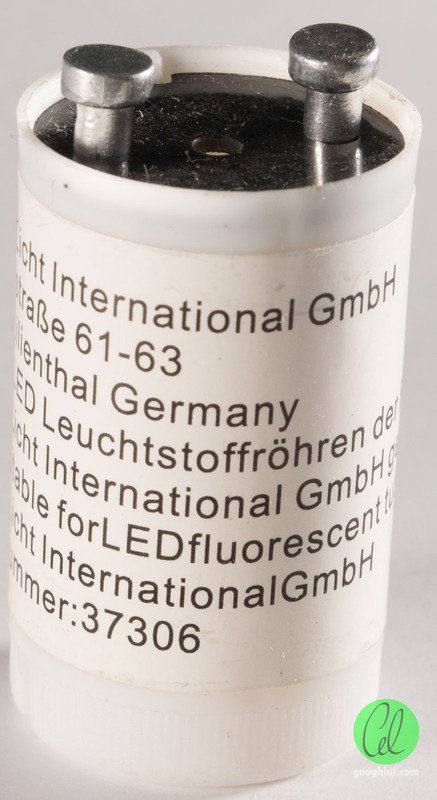 As many of the T8 fixtures are well aged, the springiness and cleanliness of their contacts can be questionable, and they may even have internal wiring connectivity issues (e.g. loose terminal blocks inside). Finally, you can also get a flicker and strange behaviour because of poor wall-plate switch contacts as I did. 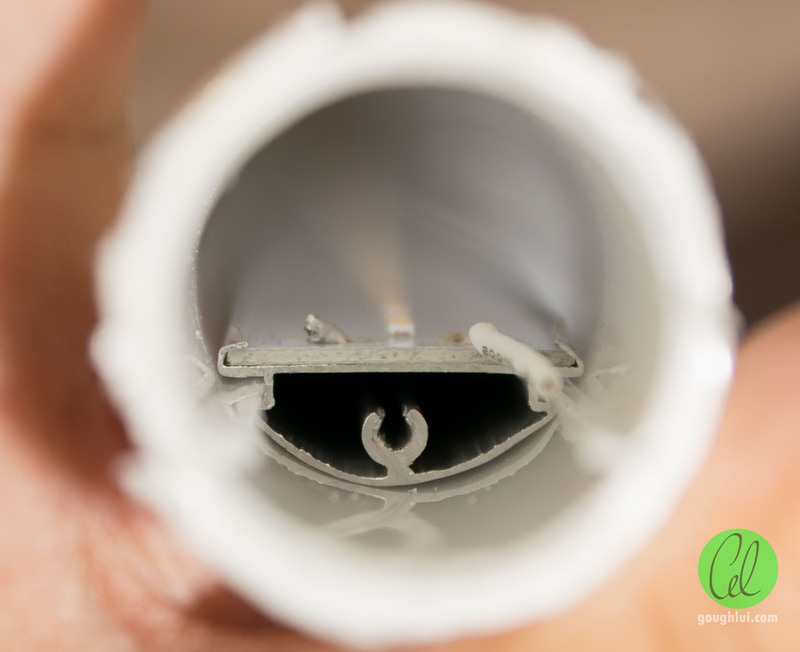 As a result, there might not be anything wrong with the tube at all – but merely something was was rectified in the process of replacing the tube. Whether the true cause of the fault will re-develop over time (e.g. oxidation) is not known. While the salvaged two-bay fitting is great for doing side-by-side comparisons, it’s not particularly helpful when we need to test the LED tube versus its old fashioned counterpart. As a result, I decided to use another fitting- a DETA branded single-batten fitting. By default, it comes configured in the “high power factor” arrangement with the power factor correction capacitor connected across the line. A simple modification can be made to remove this capacitor and turn the fitting into a “low power factor” fitting. 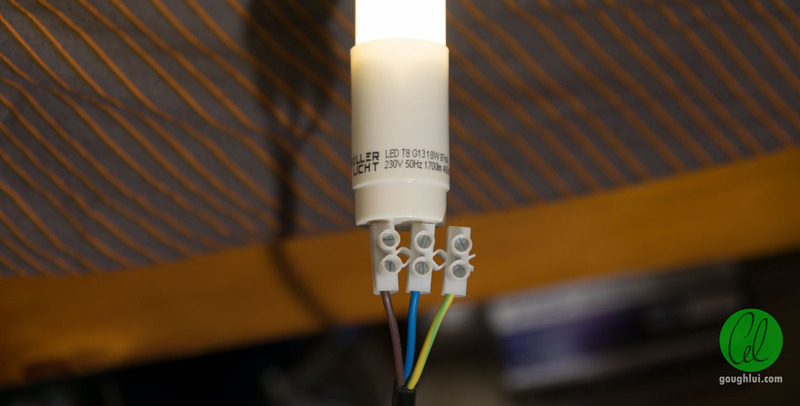 The impact of the ballast can be entirely removed from the equation as well, through “direct connection” to the lamp pins. This is highly not recommended, but was done for test purposes only. Connect the wrong end, and you basically have a dead short across the mains – a bad thing. The benchmark was the Philips Alto tube, which is a newer generation tube claiming 3250lm (90lm/W) which is almost as efficient as the LED tube. As this is a brand new tube out of the box, it would not have undergone any lumen depreciation. On light quality, I strongly preferred the Alto, as the light appeared even more natural than the Lifemax tubes I rested earlier. In terms of light quantity, the new Alto tubes did produce a fair amount more light than the Lifemax tubes and noticeably more than the LED tube. That’s not to say that the LED tube didn’t produce a sufficient amount of light, with a better distribution for most regular luminaires. That being said, as with all fluorescent tubes, it took almost 2 minutes to run-up to brightness, although with the new S10 starter, it was able to start first-go which was a surprise. 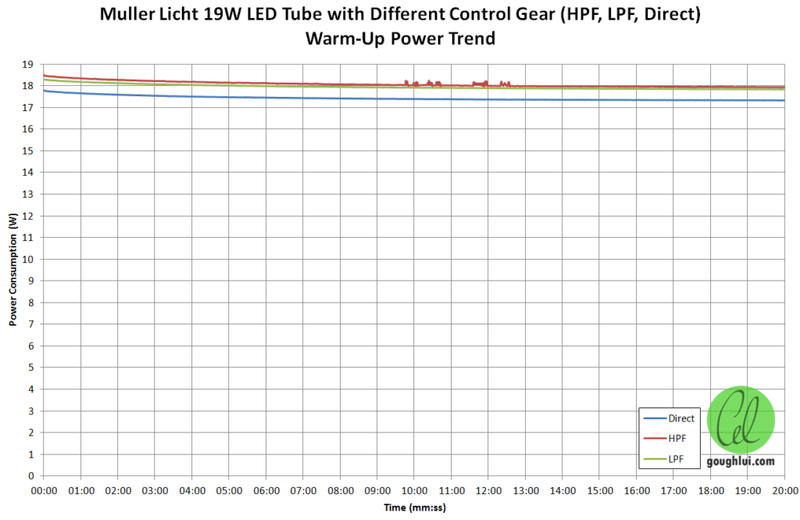 The LED tube started immediately at full brightness, and has no such power cycle penalties, so it would be a much more suitable choice for infrequently used areas which are cycled frequently, or possibly even cold areas as fluorescent tubes take longer to warm up and reach full brightness. As mentioned earlier, the LED tube is slightly flexible and has a little “give” so it can take some knocks and won’t shatter or release mercury as a regular fluorescent tube would. This could be added peace of mind where children play about, and is a positive outcome for the environment. Power was recorded using a Tektronix PA1000 and variac to trim the mains voltage to 230V. As mains was used, the voltage did have some variations (e.g. Decabit/K22 signalling) causing some ripples in the data. 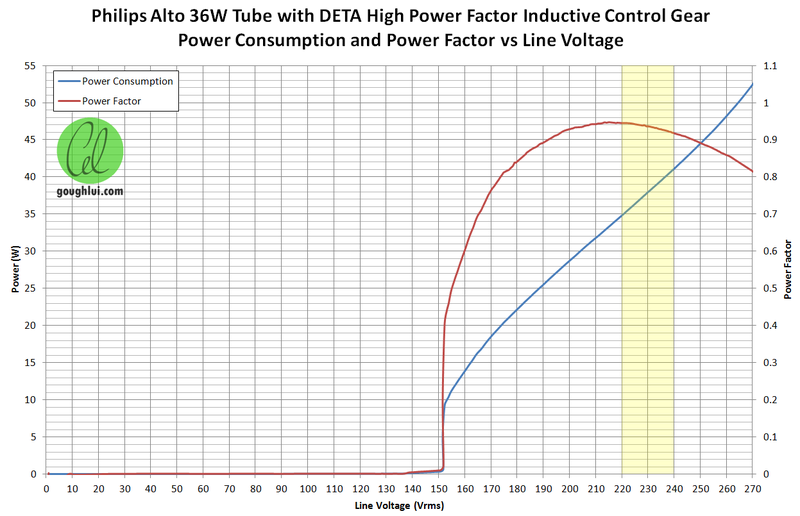 The 36W tube operating at 230V stabilized at a power consumption of 38W. This likely reflects manufacturing tolerance of the ballast and self-consumption of the ballast. The LED tube, as with most LED products, begins at a slightly higher power value before settling into its typical run values. The difference between HPF and LPF configurations was small, reaching a stabilized 18W as claimed on the carton. 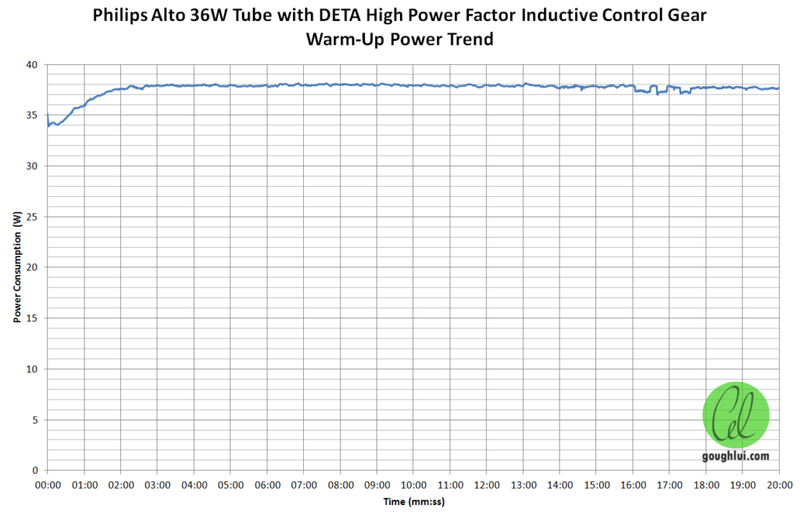 However, that is inclusive of ballast loss which can be variable, and the actual tube consumption is more like 17.3W. The classic fluorescent tube, once warmed, can be seen to have a very strong voltage-dependent power consumption. This is because its operating current is regulated by a simple choke. As a result, the power reaches 52.5W at 270v! Within the 220-240V window, its power consumption was about 34.5-41W. Power factor was corrected by the capacitor and reaches 0.92-0.94 which is a fairly good result overall. The lamp extinguishes at 152v, as there is insufficient voltage to sustain the arc within the tube. In terms of power consumption, we can see that the tube has active regulation and maintains a steady power profile from 185V and above. The power consumption generally doesn’t change much with the different power factor fixture configurations, however, the direct does have slightly less power consumption at the higher voltages (likely due to the lack of ballast losses), and slightly higher power consumption at lower voltages (likely as the tube sees the voltage that would have been lost over the ballast). Full extinguishing occurs at about 60v. However, the power factor is where the fun happens. The “high power factor” ballast configuration with the capacitor actually turns the solution into a very low power factor load (0.24-0.28), due to overcompensation. This means that the peak current will be about four times higher, likely to be capacitive. This is a doubly-bad scenario as switch contacts are often derated by five-times to deal with capacitive loads, and the low power factor will increase apparent current above that of that drawn by the 36W tubes they replace. This means that if you were very close to your switch rating limits or circuit breaker limits under regular 36W fluorescent tubes, replacing them with LED tubes will degrade your power factor and could increase wear on the switches or cause circuit breaker trips. This is especially significant in commercial retrofit situations where commercial customers may be charged on their power factor, and their large number of tubes will “add up”. However, running without the capacitor solves the issue quite well, and in fact, the added inductance of the choke likely cancels out some of the capacitance within the driver circuit, so it improves the power factor to 0.9-0.92 from the direct case of 0.82-0.84. Unfortunately, while such modifications are simple, in many cases, contractors do not perform them as they can require engineering certificates to say the modifications “are safe” etc. and they also require additional work and time. In some instances, they just replace the whole fixture instead. However, these findings do mirror the experiences of some people I know who have done large commercial retrofit installations. At this point, I was faced with a dilemma. The tube is a nice item – I’ve never had one before, and it was perfectly functional. As I was given it for a post-mortem teardown, do I just skip-over it and keep the unit, or do I break it apart knowing that it might never be a whole again? After some thought, the answer was clear – I had to tear it apart to fulfill my duties and to end my curiosity about what was inside. Because it was rather well sealed and some careful prying didn’t open anything, I went straight to the hot knife and cut my way in. This board has a transient suppression capacitor across the input, a 125mA time-delay fuse, two inductors (one on each leg) to provide RF suppression, a bridge rectifier, and some capacitance. So basically, a rectifier board that puts out about 340V DC. The unit is made by ADPOWER, which only supplies the driver boards. The manufacturer of the whole assembly is unknown. The PCB is coded TLN10(24) with a revision of P1.0 and a date code of Week 24 of 2014. There are a few anti-tracking slots cut in where the board approaches the power input pins to ensure separation. 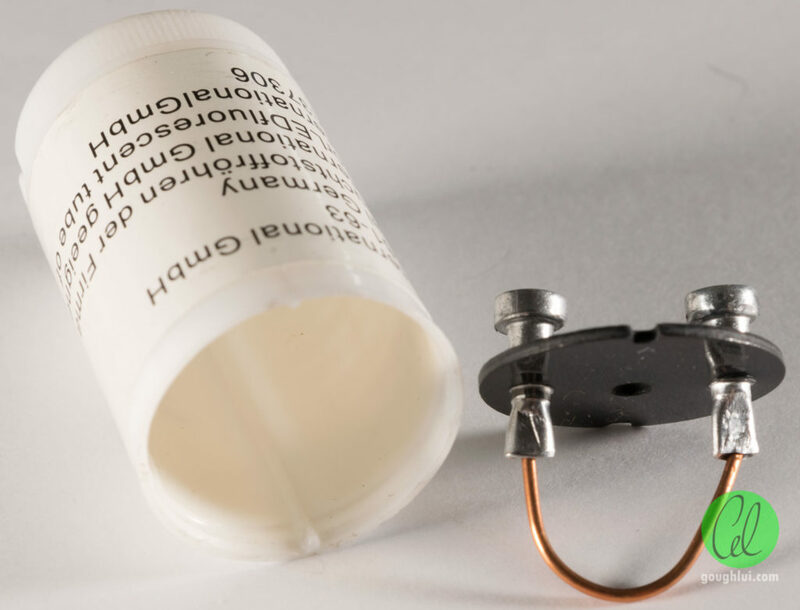 Because of the space constraints, they have used two BH 22uF 250V capacitors in series to ensure enough voltage and capacitance rating for this application. Because of this, they seem to have some diode arrangement which prevents either cap from reverse charging the other as their capacity will be different during discharge. 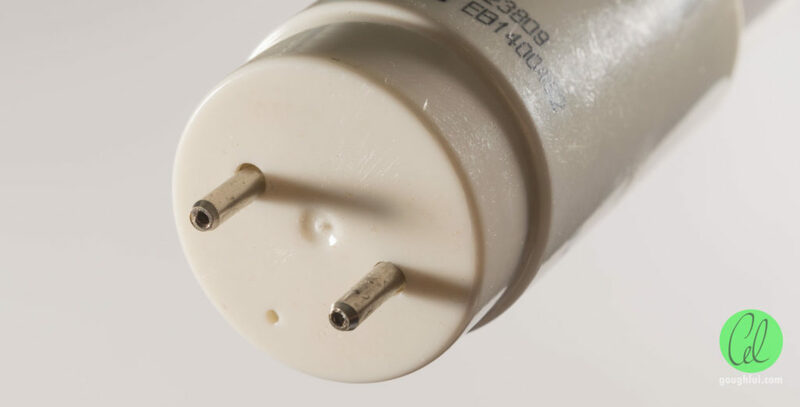 While these capacitors do have a 105 degrees C rating, unfortunately, these capacitors are not well known and are unlikely to be of the high quality needed to withstand long-term continuous service and could well be one point of failure. The other thing to note is that there has been no input surge protection devices, thus there could be some vulnerability to surge transients as well. Looking down the tube where I snapped the wire, the LEDs are mounted to a metal core printed circuit board (MCPCB) which is crimped onto an aluminium channel heatsink which sides along the ribs of the tube itself. This arrangement ensures heat dissipation is handled effectively for the LEDs which are quite spread along the length of the tube. This seems to be a sufficient approach, despite the heatsink being “within” the stagnant air confines of a sealed tube. Unfortunately, the unit does not slide out due to the use of silicone goop, and thus another incision had to be made at the other end. It reveals that the “short” at the other end is actually made of an internal fuse, thus if some fault in the board at the other end were to occur and the potted fuse on the board had failed to interrupt it, this would also do the job. Why this is also fused is unknown, as some other designs have been said to put the fuse into the dummy starter (which is more logical) so as to blow if the dummy starter was used with a regular fluorescent tube to stop the filaments from glowing and the ballast from being damaged. The board at this end is coded TLN18-235HD and has a similar date code, along with the suspect-branded capacitor. The active regulation is on this board, and is a non-isolated buck converter. Three wires enter this board – red is the DC positive from the board at the other end, black is the LED string common cathode connection and the white is the DC negative from the board at the other end. A Silan Microelectronics SVF2N60D 2A 600V N-Channel MOSFET is the primary switching element, and control is performed by an unknown 8-pin IC marked SL2109A DW30107 TXD4171. As expected, it is a matching pair, thus both “ends” of the tube have circuitry within them. A section of the tube looks like the above. You might have to click for the full size to see the features, but for convenience, here are the LEDs marked. The arrangement of the PCB is that the top line is a +ve busbar, and the bottom is the -ve busbar. The LEDs are arranged in 24 LED series strings, connected between the +ve busbar and the LED strong common cathode busbar just above the -ve busbar. 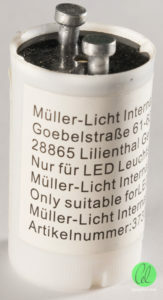 A total of 4×24 LED series strings are connected in parallel, for a total of 96 4014 type SMD LEDs. This means each LED is operating at about 188mW, and the voltage needed to operate the array is in the order of 72V, thus not really amenable to direct conversion to low voltage operation. This is about “right” as a 4014 LED is specified for about 0.2W operation. Unfortunately, the multi-parallel design does open up the possibility of mismatch between strings causing some to fail before others and limit the actual lifetime of the product. Generally most multi-parallel products only claim 15,000 hours lifetime, so the 30,000 hours claimed might be a bit enthusiastic. At the edge of the PCB, the only notable mark is the text MK-4014096D-D with a date of 26th April 2013. This post was made possible thanks to the generosity of a reader who donated me a “dead” LED tube that was still very much alive. This resulted in the ability to do thorough testing and (eventually) teardown of the unit, and my curiosity has very much been quenched by this exploration. 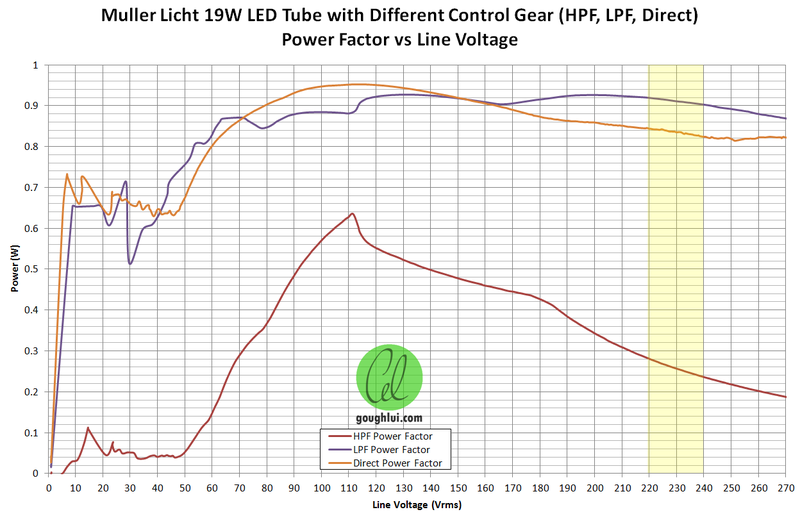 That being said, while the tube wasn’t as bright as a fresh 36W, it is definitely better utilizing its light output has a number of advantages over the old fluorescent technology even if the luminous efficacy is only similar. The tube itself had a decent design, although it is slightly let down by the unknown branded capacitors within it. The multiple LED parallel design is probably not my most preferred design when it comes to longevity, but is a common design for practicality reasons. 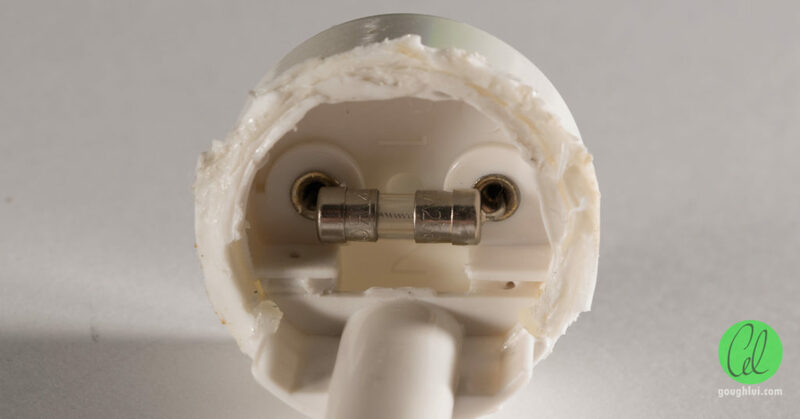 The reason it wasn’t functioning correctly may have had to do with the fitting it was used in and the condition of the connections, wiring and switches. While the reader has resolved their problem by replacing the tube, it’s important to note that the tube was “alive” when received, and nothing “loose” was identified, so it probably pays to re-test anything you think is faulty on another fitting to avoid junking perfectly serviceable lamps and save some money. 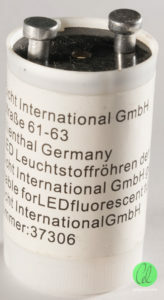 While such retrofits are great for power bills and the environment, the fact that many Australian fluorescent fittings are high-power-factor type with correction capacitors actually means that replacing the lamps is likely to increase circuit current and load on switches above that of the original tubes it replaces, even if it doesn’t show up on the power bill. This is sub-optimal since it increases cable and distribution losses, in some cases can trip breakers and a high power factor is generally preferred. Removing the capacitor is a solution, but is labour intensive and requires “re-engineering” in the case of a proper “commercial” solution. … then I did a quick megger test across the ends to verify the insulation was still good (>260Gohms recorded), and fitted it back in. To my delight, it still works, even though it doesn’t quite look as nice as when it first arrived. Definitely a win-win situation. This brings to a close all of my postings about my recent trip to Canberra. Thanks for reading – normal blog service will resume within the next few weeks. This entry was posted in Lighting, Travel and tagged canb2016, led, lighting, review, teardown. Bookmark the permalink. The use of ultra-cheap SMD 3014 (not 4014) chips shows how low tech this Aldi (that’s where it came from) tube is. I am not sure where you get 188mA, but the maths are like this: 17.3W (tube) at about 90% driver efficiency = about 15.6W on the LED array. Divided by (24 chips in each series string) 72V = 216mA across all LEDs. There are 4 parallel groups of chips, so (216/4-) 54mA per group. So, each LED is copping 54mA, which is more than double the normal maximum rating of 20mA for SMD3014 chips. That’s why it needs all the heatsinking, plus it’s just killing the chips running them that hard – a typical cheap chinese LED design. To compare how bad this is, we achieve similar light output 1750lm with 14W at a sub AU$9 wholesale sell price. 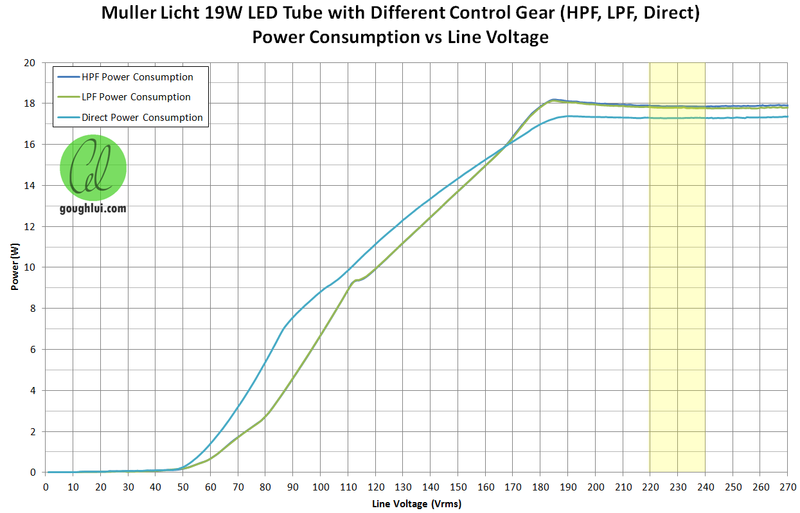 New 11.5W model uses better binned chips to get 1600lm (a bit less). I’m currently testing a new concept with 60 x SMD2835 testing at under 10W total and 1800 Lumens (yes) and it runs so cool that no aluminium is required at all, even uses a fibreglass PCB)! The BH capacitors come from Jiahong electronic in Guangdong, China. They are pretty much known for cheap price and (sometimes) acceptable quality (of their price). Not a praised one among capacitors made there.